At Native Sun, we always focus on the highest-quality ingredients, the freshest organic produce, and products from the best suppliers, this includes our wide range of beverage options available at each of our stores. Read on to learn about just a few of our very favorite beverage options we offer either packaged on our shelves or available at the Juice + Bar. When it comes to cold brew, it’s all about the process. Chameleon cold brew starts with highly select blends of 100% certified organic, free-trade Arabica beans and all-natural flavors. The beans are roasted to maximize freshness and match specific flavor profiles before they enter a 16-hour brewing process. This cold-brew process results in smooth, highly caffeinated, less acidic coffee. 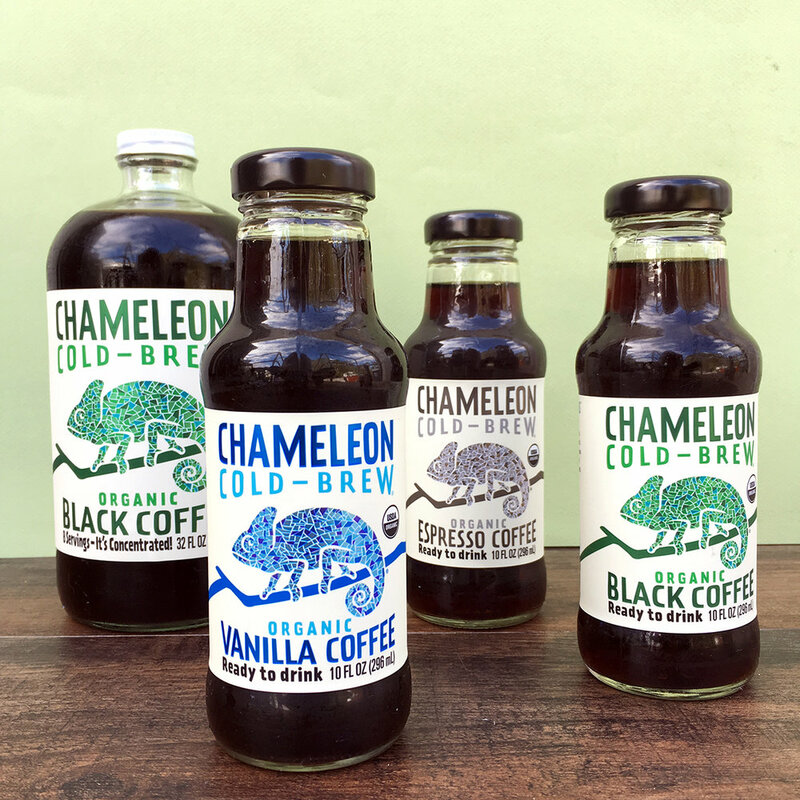 We carry Chameleon’s ready-to-drink cold brew products at all three stores and consider them an essential part of our morning routine. We partnered with Sweetwater Organic Coffee in Gainesville, Florida, to offer our customers a fair-trade, organic house coffee blend. Sweetwater imports directly from small-scale coffee farmers using a unique, principle-driven supply chain that they helped create. The supply chain, called Cooperative Coffees, is based on common-sense, win-win terms of trade for sourcing some of the world’s best organic, specialty-grade green coffee. Sweetwater is committed to long-term relationships with its coffee farmers, working with them to improve their quality of life, and paying them a fair price for the incredible coffee they work so hard to produce each year. We love companies that are working hard to improve people’s lives. We also love great coffee, and for our partnership with Sweetwater, we selected a small-batch Viennese blend. It's a big-bodied blend of dark- and medium-roast coffees with a rich tobacco aroma, light acidity, and a sweet, nutty flavor with hints of citrus. We're now serving it in stores and have individual bags available for purchase! Matcha is a powdered, whole leaf green tea, native to Japan. You can prepare matcha at home with a tea bowl, tea, and a bamboo teaspoon, or you can grab a Matcha Love’s ready-to-drink version. Either way, you’re getting the feel-good benefits associated with ingesting the whole tea leaf. Matcha is considered a “superfood” linked to cardiovascular health and bone strength because it is packed with antioxidants, flavonoids, and tons of vitamins and minerals. There’s also talk of matcha having anti-aging properties. There’s sparkling water, and then there’s Guayaki Sparkling Mate. These lightly carbonated, effervescent drinks combine fruits and spices with the complexity of yerba mate. Yerba mate is made from the naturally caffeinated leaves of the South American rainforest holly tree. It contains caffeine, theophylline, and theobromine, giving it the strength of coffee, the health benefits of tea, and the euphoria of chocolate. Unlike tea, yerba mate has low tannin content, meaning that it can give the caffeine kick you expect from a cup of coffee without the bitterness. If you’re looking for a uniquely better alternative to sugary sodas, we highly recommend making room for Mate. Buchi Kombucha is a living probiotic beverage made by fermenting black tea. Buchi uses organic, American-grown tea, premium medicinal herbs, and probiotics to create flavorful kombucha steeped in tradition. We serve Buchi’s Kombucha on tap and bottled at all three stores. Don’t miss Buchi’s Holiday Kombucha, a seasonal blend of cinnamon, cider, vanilla, and clove!